Porsche 911 Turbo también. choca en el Bash Road Tour. 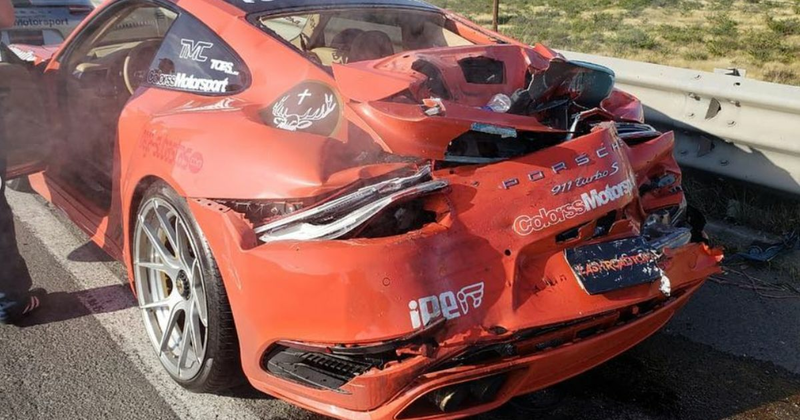 The ‘Bash Road Tour’ rally in Mexico sadly lived up to its name this week, with two separate crashes causing significant damage to a Porsche 911 Turbo S and a McLaren 650S Spider during the event. Details surrounding the accidents are scarce - currently we can only find these two Instagram posts from wreckedexoticsmexico. The post covering the 650S suggests that it happened on the Silao León bypass. Accidente hoy McLaren 650 en el Bash Road Tour en el libramiento Silao León. It looks as though something went into the back of the Porsche, while the McLaren appears to have smashed into a building at the side of the road. We haven’t been able to find any reports of injuries to the drivers, occupants or third parties, and the Bash Road Tour is yet to release a statement about the two crashes. The rally organisers have continued to post updates from the rally on social channels since the incidents, and at the time of writing have not responded to our request for comment. Update: Bash Road Tour has since spoken to Car Throttle and confirmed that no one was hurt in either incident. The 911 was damaged when a truck’s trailer hit the back of it in the suburbs of Leon, Guanajuato, while the McLaren span out before hitting the wall. The drivers of both cars finished the rally in other vehicles.